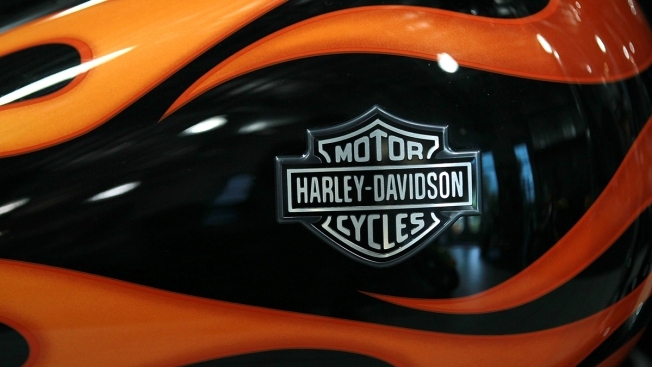 This July 19, 2011, file photo shows the Harley-Davidson logo on the gas tank of a motorcycle in Oakland, California. Employees at Harley-Davidson's Kansas City, Missouri, plant were shocked in January when the company announced that the plant would close next year, NBC News reported. Operations are being moved to the motorcycle manufacturer's facility in York, Pennsylvania. The company is also building a new plant in Thailand. A Harley-Davidson spokesman said the Bangkok plant is "separate and unrelated" to the decision to close the Kansas City plant. Harley-Davidson, like other corporations, is benefiting this year from the tax cut law passed in 2017, which slashed the corporate rate from 35 percent to 21 percent. Soon after announcing the Kansas City plant's closure, the company announced a dividend increase, as well as a stock buyback plan to reward shareholders, repurchasing 15 million of its shares — valued at nearly $700 million. The company says that the dividend increase and stock buyback is not related to the tax savings. When he visited a Harley-Davidson plant in Wisconsin in September, House Speaker Paul Ryan said, "Tax reform can put American manufacturers and American companies like Harley-Davidson on a much better footing to compete in the global economy and keep jobs in America."